Located in Canberra, this hotel offers free cable TV, free Wi-Fi and free car parking. It is a 5-minute drive from Canberra Stadium and Westfield Shopping Centre. There is a large guest lounge for your relaxation. 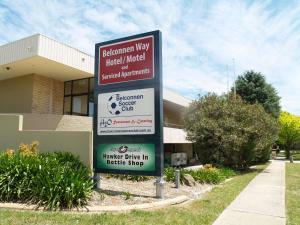 All accommodation at The Belconnen Way Hotel/Motel and Serviced Apartments Canberra includes modern furnishings and air conditioning. Apartments with kitchenette/kitchen are available. The Belconnen Way is located in the Hawker Shopping Centre which includes a supermarket, restaurants and a liquor store. Important Information: Please let Belconnen Way Hotel/Motel and Serviced Apartments know your expected arrival time in advance. You can use the Special Requests box when booking, or contact the property using the contact details found on the booking confirmation. Please note that there is a 1.5\% charge when you pay with a Visa or Mastercard credit card and a 3.8\% charge when you pay with an American Express or Diners Club credit card.